Orwell is a man of strong convictions. 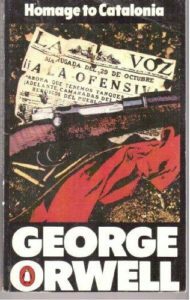 He believes so passionately in the fight against fascism that in 1936 he travels to Barcelona to fight in the revolution. Homage to Catalonia is a detailed account of the politics surrounding the revolution, a fervent defense of the working class and a witness of war from the trenches. I will be honest and say that the politics interested me very little and I much prefered the first-hand accounts of the terror of war, of being wanted by the police and the very real sacrifices in (physically) fighting for what you believe in. It was difficult to keep straight all of the abbreviations. To an outsider the differences between marxism and communism seem minimal when fighting against a strong, common enemy. Instead I was interested in the way Orwell honestly details the stench of the latrines, the horrors of the trenches and the very real issue of getting lice in your pubic hair. A lot of the war is longing for food, for warmth, and for tobacco. Some of it is getting shot as well. I had never heard about the Spanish civil war. I suppose that in European history it drowned in the advent of the second world war, but also it was a war that was lost and so it did not change much. The book however is excellent reporting and multiple times it is clear to see how his politics influences his fiction, especially when he talks about his disillusionment in the press. He details how his experiences in partaking in the war and seeing some of the events first hand are in stark contrast to the reporting in the press. He laments that history is dead and now whoever is in power will be crafting the history. This book is an interesting view in trying to describe a contemporary war, an exposition of international politics and power as well as being a testament of one man going to war as a dedication to truth and justice.